Germanium Point Contact Transistor marked 1698 3.52, first production type. 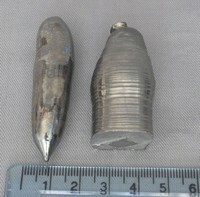 The 3.52, marking is different on some, this possibly refers to the date of manufacture i.e. March 1952. In original packing. Standard Telephones and Cables (STC) was born out of the UK branch of Western Electric USA. For Synthetic Germanium See Item A1431. First UK production Point Contact Germanium Transistor LS736 and Data sheet. Called a Crystal Triode. 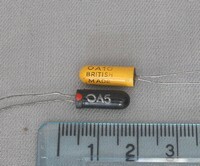 First UK Junction Transistor LS828 made by STC, and 3X301N and LS837 which are later versions. These Transistors came from STC's laboratory at Ilminster in Somerset.A label found inside this box written by the original keeper, Mr Henry Wolfson, at STC read:- 'The first point contact transistor marketed by STC', 'LS828 the first Junction transistor', '3X301n & LS873 later versions'. 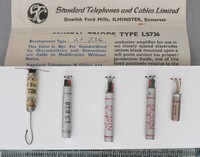 Successor to the First UK Point Contact transistor developed in the UK by STC at Ilminster in Somerset the LS737 was a Higher current gain version of the LS736. Item A1427 These Transistors came from STC's laboratory at Ilminster in Somerset. A label found inside this box written by the original keeper, Mr Henry Wolfson, at STC read:- 'The first point contact transistor marketed by STC', 'LS828 the first Junction transistor', '3X301n & LS873 later versions'. These other items can be seen under A1427. Microscope slide showing the internal parts of a Junction Transistor. From the Laboratory of STC at Ilminster. 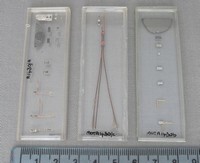 Various forms of packaging and parts for early STC Transistors. Including two complete devices and an LS828 junction transistor. Six Items from STC at Ilminster. 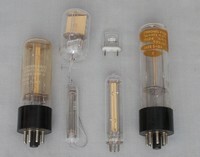 The top three are Thermistors with their Original tube packing. The bottom three are early diodes, including a Point Contact version, and an early Photo diode P50a or P50b. The sample shown is the original first sample of Germanium grown by Henry Wolfson MBE in the UK. And on the right, is a cut down section used for research. Grown at the Laboratory STC Ilminster Somerset. He was interested in electronics from an early age. He knew John Logie Baird and was involved with the Television Society which was formed in 1927, now The Royal Television Society. He was made a Fellow of the T.S. in 1927. During the 2nd World War he worked on top secret work and was described as a Boffin. At the end of the war he joined a scientific investigation team touring Germany, he went as a RAF officer. Mullard light sensitive transistor known as a 'Phototransistor'. As these were more expensive than ordinary transistors, it was found that an OC71 transistor (much cheaper) was also sensitive to light if the paint was remove from its surface. Mullard later changed the jelly surrounding the germanium element inside probably to stop this being possible. Mullard germanium Transistor of the 1960's use in Radio receivers for Radio Frequency amplification. Not many of these would still be working today as they suffered from a problem known as 'Whiskering' internally which usually connects the workings inside to the casing and worse, disconnecting the outer shell, which is used as a screen, does not always work. The price on the box is a massive 7 shillings. 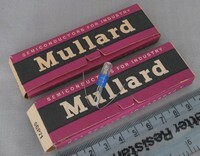 Early Germanium Junction diodes from the 1950's made by Mullard. The OA5 is 'Gold Bonded'. Advantage or Sales pitch! Hfe50. -80v Collector. Current 1A. Frequency 250Khz. Germanium Alloy junction Power transistor, similar to the T1040 of 1956, giving 12 Watts of power. Using a TO27 package with flexible leads, with the actual transistor mounted inside the dome. Because the standard became the familiar TO3 package this devices life became limited, although in 2010 some of these are still being sold as replacement parts today. Joined presumably a matched pair. It takes 3 Million years for a Quartz block of this size to grow naturally, this specimen was grown in the STC Harlow Laboratories in 3 weeks. For its application see Item A1424. Various types of Quartz crystal units dating from the 1940's. Quartz crystals are used in many electronic systems for providing stable oscillators, such as Signal Generators, Communication Transceivers, they are used for filters as well, possibly a more common use in modern equipment. Also any equipment that needs to remain stable in operation. Such is the importance of stability in some applications that these units are operated inside temperature controlled ovens. One disadvantage of quartz is that it continues to change over time, over many years the value to which these units are made will vary slightly, causing an error requiring a replacement of the unit. Variation is usually 1 in 1000,000,000 times per day. For Synthetic Quartz See Item A1421.